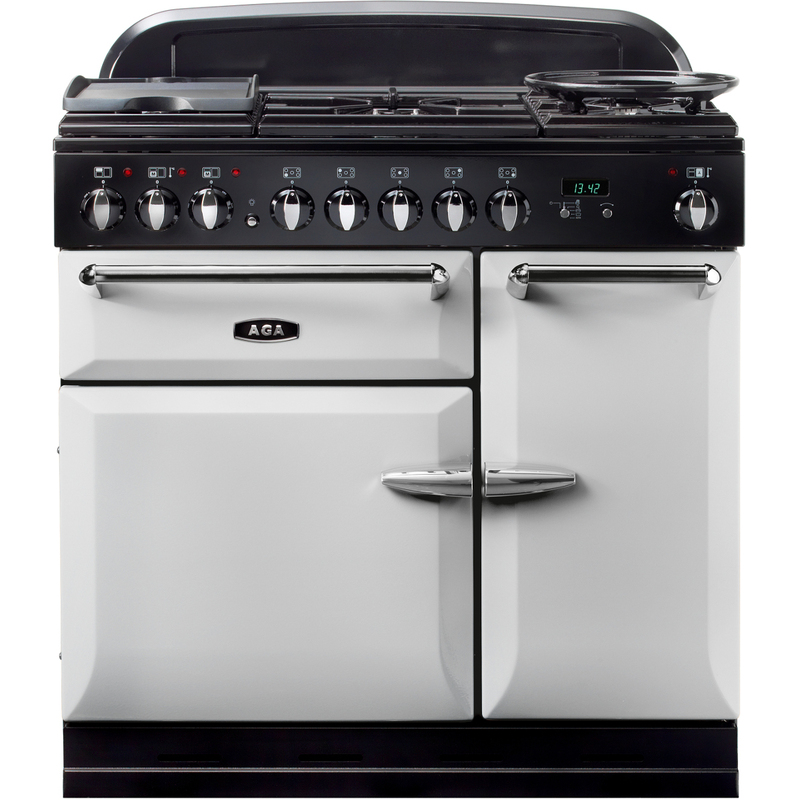 The AGA Masterchef XL range cooker displays timeless design quality that enables it to fit into any style of kitchen. It’s classically simple understated appeal will match any taste, from the contemporary to the traditional and is available in a choice of five colours to suit your kitchen décor. Fan Oven – This tall slim 67 litre oven is designed to accommodate a number of cooking dishes and has the ability to cook four whole chickens at the same time. A handy plate rack is also provided for use in this oven. Gas Hob – With five burners on the AGA Masterchef XL, the gas hob provides the optimum heat level to suit your cooking Each of the gas burners on the AGA Masterchef XL gas hob are rated to provide the optimum heat level to suit your type of pan or style of cooking. 2 x MEDIUM BURNERS (1.7kw) Ideal for warming soup, boiling vegetables, cooking pasta or rice. 1 x SMALL BURNER (1.0kw) This burner is for attentive cooking such as scrambled eggs, cooking sauces or something that generally needs a low heat and needs stirring constantly. 1 x WOK BURNER (3.5kw) These types of burner are ideal for “flash” heat cooking and stir fries. 1 x LARGE BURNER (3.0kw) This is great for your frying pan to cook your lambs liver, bacon or pancakes, allowing fast and controllable heat. GRIDDLE Made from robust cast aluminium, the griddle plate sits snugly on top of the hob, when required. The flat plate is ideal for cooking eggs, while the grooved plate provides fat drainage, offering a healthier way to sear steaks, burgers, vegetables and fish. WOK RING An enamelled cast iron wok ring is supplied with the gas hob model. For over 90 years, AGA has devoted itself to the art of cooking good food. Whilst it’s true that a good ‘chef’ can cook anything well, the better the cooker the better the result – which is why they make the best cookers in the world.